In the winter of 1823, a band of frontiersmen is preparing their large haul of animal pelts for return to a remote fort/trading post in the unincorporated U.S. territories (eventually, the Dakotas and Montana), when they’re attacked by a tribe of Arikara Indiana (also known as “Ree”). Led by Hugh Glass (Leonardo DiCaprio) and his half-Pawnee son Hawk (Forrest Goodluck), a small group of these men manage to escape by boat down river. Hugh decides they should hide the pelts they’ve manage to save so as to escape Ree pursuit – they can always come back for them later – and the Captain of the expedition (Domhnall Gleeson) agrees, but the decision angers another of the trappers, a hard man named John Fitzgerald (played by Tom Hardy). When Hugh is brutally attacked by a grizzly on their way back to the fort, John is tasked with remaining behind with him to bury him properly when he dies. Instead, John kills Hawk and abandons Hugh to his fate. But against all odds, Hugh survives and must face the equally-brutal landscape in order to seek his revenge. Shot largely on location in mostly remote wilderness areas of Alberta, Canada (as well as Montana and the southern tip of Argentina) and entirely in natural light (often during the so-called “magic hour” before sunrise and after sunset), The Revenant is a piece of masterful filmmaking. 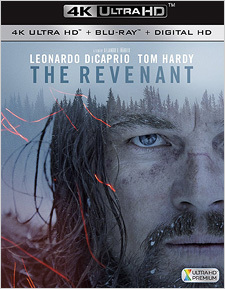 The Revenant was captured digitally by director Alejandro Iñárritu and cinematographer Emmanuel Lubezki (a.k.a. Chivo) in ARRI Raw (6K) and Redcode RAW (6K) formats using ARRI Alexa 65 (with Hasselblad Prime lenses) and Red Epic Dragon cameras. The film was finished to a 4K Digital Intermediate in the 2.39:1 aspect ratio, and that DI was used to produce Fox’s 4K Ultra HD Blu-ray presentation. It’s worth noting that the color grading for Ultra HD was done separately from the regular Blu-ray. Though both were supervised and approved by Chivo and Iñárritu, different choices were made – particularly once they saw what HDR was capable of. So while the Blu-ray color timing has a somewhat cool and stylized look, the Ultra HD offers a much more naturalistic presentation. Having grown up on this part of the country, I can attest that the Ultra HD image does indeed accurately capture the dramatic look and feel of this landscape. The sheer impact of the imagery in The Revenant is extraordinary – it really has to be experienced in order to fully appreciate what that means. The landscape itself is a character in this film, alive with portent and potential in virtually every scene. The Ultra HD presentation captures the theatrical experience perfectly. There’s a little bit of color banding visible, resulting from the conversion of 16-bit color (the native color space of Redcode RAW) to 10-bit for this disc, but it’s never distracting. This image is so good, there are times while watching it that you just have to stop and marvel at what you’re seeing – the refined detail, the vast and intricate color palette, the deep dark forest shadows, the glassy-glare of sunlight reflecting off a flowing stream or ice. And the atmospherics! Fog, mist, cloud, smoke, sunlight illuminating these things and filtering through them. There’s a brief scene, at about 56:25, in which a wave of dark clouds spills down over the top of a mountain toward the camera, backlit by the cold winter sun, and it’s as if the hand of God is reaching down. The Revenant is, without doubt, one of the most beautiful looking films I have ever seen, and I’ve never seen such imagery more stunningly rendered in my home theater before. The film’s audio is available on the 4K disc in an incredibly immersive English 7.1 DTS-HD Master Audio mix that completely surrounds and transfixes you with the subtle sounds of the primal forest, of wind, of water. The dynamic range is a perfect match to the images – the mix is muscular and aggressive when it needs to be, but otherwise delivers a steady flow of sonic atmospherics that put you right in the middle of this environment. Meanwhile, the film’s score, which is by turns austere and evocative, adds just the right seasoning of majesty, of desolation, of elemental humanity. Some viewers will no doubt be disappointed that this disc doesn’t includes Atmos or DTS:X, but I wouldn’t fret about it. This is a magnificent 7.1 lossless audio mix. Additional audio options include English 5.1 Descriptive Audio, Spanish 5.1 Dolby Digital, and 5.1 DTS in French, German, and Italian. Optional subtitles include English SDH, Spanish, French, Dansk (Danish), Nederlands (Dutch), Suomi (Finnish), German, Italian, Norsk (Norwegian), and Svenska (Swedish). There are no extras on the 4K disc itself, but the Blu-ray version is included in the packaging. It includes one of the most fascinating special features I’ve seen in some time, a documentary called A World Unseen (44:04). It begins with Iñárritu sitting on a soundstage, being shown images from the film and its making to inspire a certain mode of thinking in the filmmaker, who then opens up about the challenging production and how the process of making of the film informed him about history, the state of the world today, and himself. This is intercut with footage from the film, material shot on set to document the production, and interview footage with the cast and crew. So the piece is both document and comment, and offers both the filmmaker and its audience the kind of perspective that comes from consciously taking the time to reflect back upon what’s you’ve just done, what you’ve just seen and experienced. The Blu-ray also includes a gallery of images from the production, and there’s a Digital Copy code in the packaging. Forget everything you may have heard about The Revenant and just see it for yourself. It’s a rare and genuine achievement in purely cinematic storytelling of a kind that is seldom attempted at this scale anymore. As such, it demands to be seen in the best possible A/V quality. Thankfully, Fox’s Ultra HD Blu-ray delivers that quality in spades. If you’re looking for a reference-grade 4K video experience that beautifully illuminates the full impact of HDR and the raw power and potential of the Ultra HD format, this it is.